When the German decision was taken to attack Poland, it was with the firm knowledge that the Luftwaffe was even more ready for war in September 1939 than it had been a year earlier at the time of the Munich climb-down. The British and French bought a year’s grace for themselves by sacrificing the Czechoslovakian nation, but the Germans made better use of that time preparing for the final show-down than the Allies. The decision to make 1 September 1939 the deadline for the attack, even at the risk that Britain and France would, this time, honour their obligations to the Poles, meant that Generalfeldmarschall Erhard Milch’s long-term plans for the development of the Luftwaffe to its peak strength in 1942 had to be abandoned. Despite this fact, the kind of war that Adolf Hitler envisaged, limited but annihilating campaigns of short duration against each of his potential opponents in turn, was well within the grasp of the Luftwaffe as it then stood and, vis-à-vis the Allies, the Germans had several important advantages. Firstly, they were ready; the Allies most certainly were not. The Luftwaffe had been placed on a full war footing early in 1939 and was primed for immediate action to an agreed plan. Secondly, the occupation of Czechoslovakia had given them additional facilities, airfields for training and aircraft factories like the Tatra works. Thirdly, they had the benefit of modern combat experience fed back from their Legion Condor contributions to the victory of General Franco’s forces in Spain. In particular, many of the theories of army cooperation and close air support were put to the practical test and invaluable lessons absorbed. Finally, the opponents had their own re-armament programmes in full swing, which meant that, even though Germany might be more ready in 1942 than in 1939, its opponents would have caught up, and the balance would not have been so favourable to the Luftwaffe at that later date. Much criticised for failing to develop a long-range strategical bomber, the fact was that there was no outstanding requirement for such a weapon in order to achieve Germany’s military ambitions in 1939 so, although such a project was under active development, the short-term requirements of interdiction and back-area bombing in support of the Wehrmacht and its Panzer columns were paramount. It was here that the dive-bomber arm came in. The subject of many post-war myths that refuse to die, in fact dive-bombing had been invented, used in combat action and carefully analysed and tested by the British, all in the period 1917–19. The Americans, usually credited with its introduction, came late to the concept, picking it up from the RAF in France and later making very small and limited use of it with their Marine Corps units in Haiti and Nicaragua. It was not until the late 1920s that the US Navy began to really take notice of its potential, and much later that they developed the ‘Helldiver’ concept, so often held up as the origins of the German Sturzkampf force. In fact long before the much-hyped purchase of two Curtiss F8C-4 biplane aircraft from America by Generaloberst Ernst Udet, the Luftwaffe had been conducting its own dive-bombing trials at the secret-testing ground at Lipetz in the Soviet Union, and observing similar experiments conducted by the Swedish air force at Fröson. As early as 1933 test pilot Willi Neuenhofen had conducted a series of twenty-six dive-bombing tests with the Junkers K-47 monoplane fitted with bomb-racks, experimental two-ring eye-sight for vertical bombing, a direction gyro, air brakes, automatic recovery devices and other specialist equipment. Indeed, the clandestine Luftwaffe had developed two generations of biplane dive-bombers, the Heinkel He 50, which went into commission with the first dive-bomber group, Gruppe I./162 on 1 April 1936, and the Henschel Hs 123, which entered service in 1937 with the St.Gr. 1./162 ‘Immelmann’. 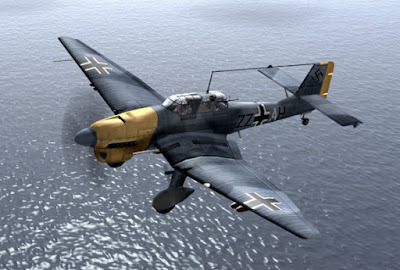 This was at the same time that the Junkers company were developing their own monoplane dive-bomber, the Junkers Ju 87, through its early design and test models, into the working ‘Anton’ series that was battle-tested in Spain and on to the ‘Bertha’ type, the B-1 version of which formed the main complement of the Stukagruppen with which Germany went to war. There was no great consensus at the Technisches Amt of the Reichsluftfahrtministerium (RLM) for the dive-bomber; in fact the higher echelons of the Luftwaffe were evenly divided into pro- and anti-dive-bomber camps. The basic requirements for Luftwaffe war operations were enumerated in the Air Field Manual of 1935. The number one priority was the securing and the maintaining of air superiority; everything else was subordinate to this. Once achieved, the second priority was spelt out as ‘action in support of the ground forces’. From this the Luftwaffe never wavered and it was in marked contrast to the air forces of Britain, the United States, France and Italy, to whom any hint of cooperation with the army, other than by aerial spotter aircraft, smacked of subservience to another service. One of the major opponents of dive-bombing was Generalfeldmarschall Wolfram von Richthofen, who underwent conversion during the Spanish experiences and became the leading exponent of the dive-bomber with VIII. Fliegerkorps during the Polish, French, Balkan and Russian campaigns. Udet’s greatest contribution to the existence of the Sturzkampf was his immediate reversal of Richthofen’s cancellation of dive-bomber development when he succeeded him as head of the Development Branch in June 1936. The basic theory of dive-bombing was of the utmost simplicity. Given that various factors of the speed of the aircraft in horizontal flight, wind strength, sighting difficulties at high altitudes, drift of the bomb in descent and so on, all added to the difficulties of achieving accuracy in the delivery of bombs, it was only common sense that any method of attack which eliminated most of these would naturally result in a higher rate of success. By aiming the whole aircraft at the target, holding it there while the eye-sight was lined up, descending to a low level before bomb release, and thus ensuring the trajectory of the descending missile followed much more closely the trajectory of the aiming carrier until within the last few minutes of its flight time, enormous accuracy was achieved by dive-bombing. In fact pre-war tests showed that a factor of more than ten to one was commonly achieved. This being a perfectly reasonable factor, the adoption of dive-bombing was a logical step for any nation to adopt. What turned the British, Americans and Italians against the concept was a combination of several factors, differing in origin, but combining to make an almost pathological aversion to the use of the dive-bomber. Let us examine each in turn. Firstly was the ingrained wishful thinking that the heavy bomber laying waste to opposing nations’ cities and populations would quickly win any war, alone and unaided, and make protracted land warfare and naval blockades, with their respective carnage and mass starvation, a thing of the past. The air weapon was relatively new and was embraced by the popular media of the day automatically as against old methods, which had led to such terrible casualty lists in World War I. If there was a short-cut then it was welcomed by the politicians, especially in the western democracies, ever shy of providing adequate defence if it meant loss of votes. The newly formed air forces, shrilly proclaiming their independence and fighting for survival in a period of shrinking budgets, insisted that the heavy bomber was the answer. People like Douhet in Italy, Trenchard in Britain and Mitchell in the United States had their dubious but loudly proclaimed theories endorsed by, for example, the British premier Baldwin, declaring that ‘the bomber would always get through’ as an excuse for not providing sufficient fighter defences. Independence was everything to these airmen and so the total commitment to aiding the army in land battles, the cardinal feature of the Luftwaffe, was utterly alien to them. Secondly, and allied to the above thinking, the British and Americans had convinced themselves of two incorrect assumptions. One was that the new altitude bomb sights, like the Norden in America, would produce accurate hits from a great height. The USAAF declared that the new B-17s using this device would drop ‘a bomb in a pickle barrel’. The war that came soon showed that such heady assumptions were so much hogwash. The RAF bombing campaign of 1939–42, which the BBC daily declared was destroying German cities and their capacity to wage war, was a total failure, with some bombs being dropped as much as five miles from the target. So much for high accuracy. At sea results were even worse, with moving warships proving almost impossible to hit, let alone sink, by high-altitude bombing, despite incredible claims to the contrary. The German fleet sailed through the English Channel in 1942 and was to have been attacked by over 250 RAF bombers, half of which failed to even locate the ships in that narrow stretch of water, while the other half attacked both British and German ships indiscriminately without causing any damage. In the Mediterranean the same thing happened with the Italian high-level bombing and British fleets and convoys paraded up and down the length of that sea almost as they pleased, until the arrival of the German Stukas on the scene. At the Battle of Midway the B-17s were credited in the New York press with having destroyed the Japanese fleet, but failed to score a single hit, although they almost sank an American submarine which they claimed was a Japanese heavy cruiser. The other factor that turned the west against dive-bombing was the claim that modern ‘high-speed’ monoplane aircraft were unable to dive-bomb at an angle of much more than 30 degrees. RAF experts said it was impossible, and relied on low-level attacks by Battles and Blenheims, which proved totally useless. This was a nonsense and by the end of the war such high-performance aircraft as Spitfires, Thunderbolts, Mustangs and Typhoons were all employed as dive-bombers. Finally, and here some elements of the Luftwaffe agreed, antiaircraft fire had reached such perfection that to dive below a certain level was tantamount to suicide and could not be contemplated. Again, the theory was sound, but in practice it required very steady nerves to stand at a gun while a line of dive-bombers was descending directly towards you. In practice, losses were small and the hits achieved by the dive-bomber were many. If a two-crewed dive-bomber, cheap to produce and economical to run, adaptable and able to keep up with a moving front line, could hit the target ten times as often as a larger six-or seven-crewed heavy bomber from its fixed airfields and with enormous costs, it made a more viable weapon of war. So dive-bombing, rejected in the west, made for a cost-effective proposition to the new Luftwaffe. Thus it was that, on the outbreak of war, the Junkers Ju 87 B-1 (commonly known outside Germany as the Stuka, an abbreviation of Sturzkampfflugzeug which in the Luftwaffe meant all aircraft of the dive-bomber type), equipped all eleven active German dive-bomber units, the III./St.G. 51 with Luftflotte 3, the I./St.G. 1, the I., II. and III./St.G. 2, the Stab, I., II. and III./St.G. 77, IV.(St)/LG. 1 and the 4.(St)/Tr.Gr. 186 all with Luftflotte 1. There was a theoretical establishment strength of 319 dive-bombers, given the job of destroying vital objectives well behind the front lines, such as aircraft and tank factories, ammunition dumps, airfields and aircraft on the ground, military headquarters, key rail and marshalling yards to hamper the movement of enemy troop formations, bridges and viaducts, and so on. 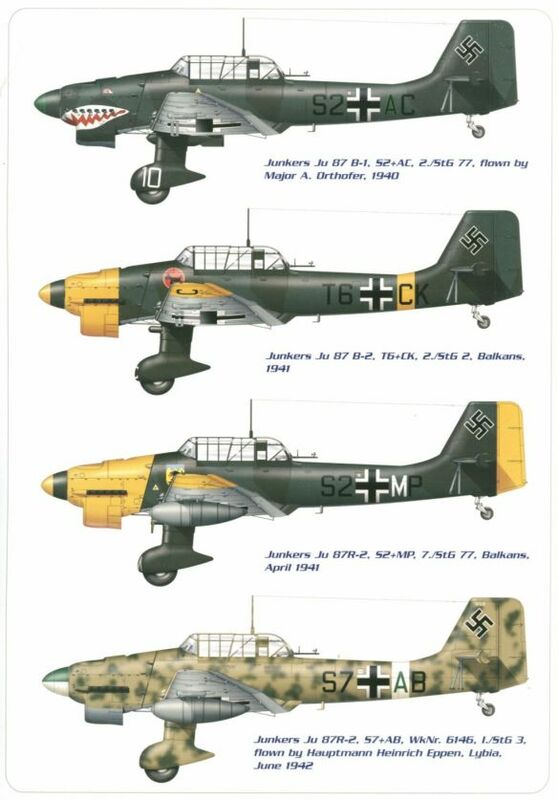 In fact these were much the same objectives given to all other bomber arms, but the Stukas had the vital asset of accuracy, being five or six times more likely to hit what they aimed at than any level bomber. Added to these ‘back-area’ requirements, were the ‘targets of opportunity’ and true close-support roles, in which the dive-bombers would attack any enemy strongpoint or fortress, or concentrations of artillery, tanks or infantry that sought to make a stand against the Wehrmacht It was known that the morale of unseasoned troops cracked when confronted by dive-bombing, which is a very personal form of aerial attack, and this was later to be played upon with the introduction of wind-siren devices on both the Stuka and its bombs, which added to the natural howling scream of an aircraft in a steep dive. It was not known just how effective the Stukas would be, and their outstanding successes in all these roles came as almost as big a surprise to its Luftwaffe advocates as it did to the stunned recipients of its visitations. Critics always state that the Stuka depended totally for its initial, and its continued, success, on the establishment of air superiority. This is perfectly true, but what they do not add, ever, is that this is a requirement for all bomber aircraft, not just dive-bombers. It was proved very quickly that Allied long-range types like the Vickers Wellington could no more operate without this requirement, than could the Stuka. The RAF soon switched to night bombing as it could not face daylight fighter interception any better than could the Junkers Ju 87. The huge Allied four-engined bombers of the later war period, like the Avro Lancaster and Boeing B-17 Fortress, designed to win the war unaided, proved just as vulnerable without air superiority as the Stuka was, and their losses were appallingly higher. What the Stuka achieved, when it had air superiority, was the transformation of air and land warfare, with countries falling in days and weeks rather than after campaigns that lasted for years. Moreover, it was the combination of Stuka and Panzer that won these battles, the combined effect of both working in harmony far outweighing the impact of the individual components, and they proved a winning, and (in terms of lives) economical team. The conquest of Poland cost a mere thirty-one Stukas, most of these to AA fire. The Stuka’s inherent accuracy, already also tested in Spain, proved to be a potent weapon against warships also, and this task too was added to its growing agenda as the war developed. The Norwegian campaign was a small-scale affair compared to Poland, but it again emphasised the versatility of the Stuka, now equipped with long-range fuel tanks. A small number of dive-bombers operating against fortresses, slow-moving Allied troop columns and, especially, against the Allied naval forces off the coast, proved decisive. The invasion of the Low Countries and France in May 1940 brought to a triumphant conclusion all the lessons learnt in the earlier campaigns and it proved the absolute superiority of the mobile form of warfare perfected by the Germans and given the name of Blitzkrieg by the American press, over the static form as practised by the Allies, who, even with nine months’ warning, proved unable to cope with it. It was Poland on an even larger scale and the defeat of the Netherlands, Belgium and France was achieved within a six-week period for the loss of only 120 Stukas from all causes, which included thirteen shot down by naval gunfire over Dunkirk. With the fall of France a different type of situation developed and the English Channel could not be taken at the charge like the river Meuse or the Aisne. However hard the Stukas might hit RAF airfields and installations in Kent and Hampshire, the immediate follow-up and over-running of the impacted targets could not be made by the Panzers; one half of the winning team was lacking. Airfields devastated by dive-bombing were therefore given ample time to recover, fighter squadrons could be rested out of Stuka range and rotated. On the occasions when their own fighter cover failed to give them adequate protection the Ju 87s naturally suffered severe losses. In the Battle of Britain a total of fifty-nine Stukas were lost (but not the ‘hundreds’ claimed by Winston Churchill and the British press) during the months of July and August. Yet morale remained high and there is no doubt that, had the Wehrmacht finally got ashore in Britain, the smooth-running team of Panzer and Stuka would have been just as effective against the remnants of the ill-equipped British army, however gallant, as they had been earlier against the fully prepared regulars. It was not to be, but the Stuka story was far from over; indeed it had hardly begun. The aircraft that made the very first bombing attack of World War II was to go on fighting in the front line, by day and by night, until the very last day of that conflict.